NEW YORK -- We picked back up this week with the drama from Nicole and Onyeka. Colton stormed off and was just wandering the beach while the women sat around and continued to fight. You know it's serious when Chris Harrison has to be called out to talk Colton down. He was starting to get confused and worried that the women weren't really there for him. Just like that Nicole and Onyeka were OUT! Colton was setting the example that he will not stand for drama. He means business! Colton started the next day on the beach in Vietnam and he hoped that he could get clarity in a lot of the relationships this week. The first date card arrived at the hotel and it read, "Hannah G., we really need this date." Colton picked her up and they went to a spa. They were covered giant leaves and couldn't stop kissing each other! It was very romantic. She gave him a massage and then a make-out session. If that wasn't steamy enough, they took a mud bath together and then had a very intimate shower complete with lots of leg wrapping. For the evening portion, Hannah told Colton that she doesn't normally open up, but this time she wants to get serious. Her parents got divorced and she remembered her mother driving through the yard to pick up their stuff. She said she has a vivid memory of the moment they weren't a family anymore. Colton said that he avoided learning the reasons for his parents' divorce because he didn't want to change his opinion of either of them. With that, they made out and he gave her the date rose. He told her that she reminds him of home. They danced to a traditional Vietnamese band. The next date card arrived it read, "Cassie, Heather, Tayshia, Caelynn, Katie, Hannah B, Sydney, Demi, are you ready to fight for love?" Oh boy, that meant that Kirpa was getting the next one-on-one date. Demi is usually pretty strong, but not getting the one-on-one reduced her to tears. Colton took the women to learn how to do some martial arts. They fought with some bamboo sticks, learned how to punch and kick properly. The host of "The Bachelor Vietnam" and Chris Harrison were there to call the head-to-head battles. The women were bringing out their fiercest moves to impress Colton. They mostly giggled as they punched each other, that was until Demi and Katie had their turn. Demi did not have a good time and got punched in the face. Colton decided that he'd seen enough and asked them all to go to the afterparty. All of the women who didn't get a one-on-one yet were in a bit of a sour mood going into the evening. He tried to reassure Tayshia and they ended their chat with a passionate kiss. I wonder if Colton is bored at all on this date? I'm getting a bit bored of hearing every woman say that it's a tough week, they're afraid Colton thinks they are holding back, and then they cry about the possibility of going home or never getting a one-on-one. Meantime, Sydney is about to explode. When she finally got her time with Colton, she went into it with a bad attitude. She gave him the third degree about not giving her a one-on-one date. He did his best to explain why he has made the decisions he has so far. Demi told him she doesn't want to be punching other girls, she wants to be soft and sensitive around him. Then she asked Colton to call her mom who just got out of prison. Colton agreed and they had a nice chat. Demi seems like a very caring and forgiving daughter. I think that bonded them. Sydney then went back up to Colton and told him that she needs more from him and that he's making "easier choices" when it comes to who is picking on the dates. What?! That's a bit insulting to him and the women there. Sydney went on to tell him that she's going to go home because it's not working for her. Once he walked her out, he gave the group date to Tayshia. Colton tried to shake off the disastrous group date and he met up with Kirpa for their one-on-one. They chatted briefly about Sydney leaving since Kirpa was friends with her. They boarded a boat and then jumped in the water to go sea urchin hunting. Their faces were funny, they didn't actually seem like they enjoyed eating it. Later that evening, Colton and Kirpa went to dinner at an outdoor restaurant. Colton jumped right in and asked her what was the deal with her ex-fiance. Kirpa said they were together for eight years and he was saving himself for marriage. She said it was the right decision to break up because he wasn't what she wanted in a partner. Kirpa said that she really wants to meet the right person. Colton said that he's excited to be engaged and he wants to get there by the end of the show. Kirpa agreed that she would be ready to be engaged to him by then. Despite it not seeming like a great date, Colton offered her the date rose. Back at the hotel, Demi was getting all done up and applied about a thousand layers of lipstick. She went off into the stormy night to pay Colton a visit. Demi said that she was going to try to de-virginize him. Colton broke out the booze (or was that water?) right away. She went in for a kiss and started to talk to him about how he was doing. Demi kept talking about how great everything was between them and then professed that she was falling in love with Colton. Colton told her that he appreciates her telling him that and she makes him feel special, but he doesn't think that they can "get there." Oh wow, way to break her heart, Colton! He felt too terrible to put her through a rose ceremony after hearing that she loves him. He sent her home on the spot. That sure didn't go how she had hoped. That meant Katie was eliminated. It's kind of sad he had to put her through the whole rose ceremony when she was the only one who didn't get a rose. On the way out, Katie warned him that some of the remaining women aren't ready to get married. So far, every woman leaving has warned him. He's getting really frustrated by it. He doesn't know what he is missing. 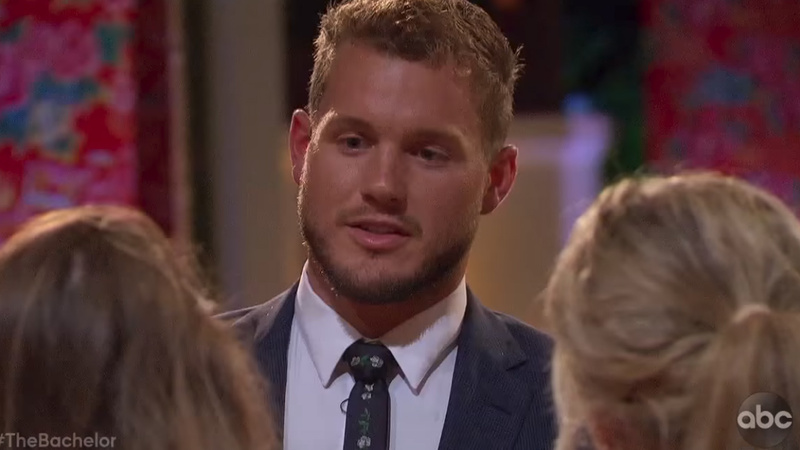 Colton walked back in and pretty much begged the women to be honest with him about who wants to be there and said he would be searching for answers next week. Meantime, Kirpa and Tayshia started to plot behind Colton's back and were saying "Let's take this whole thing." What? Seems like some people are still there for the wrong reasons.